The rumours and predictions that Facebook would be the death of blogging seems to have been greatly exaggerated. Blogging has instead evolved into a media rich ecosystem that is performed by individuals and companies to great effect. Blogging can position people as experts and thought leaders. It provides a home base portal that can provide a resource for their viewers and readers. Blogging is not just about writing articles, as the advent of broadband networks available on mobile and fixed devices has seen the rise of video bloggers from cooking to travel. Visual and video communication is now quite often preferred to reading. So how do you put together well produced videos as a blogger? This is the second of a three part series where we look at how to put together a professional looking video on a budget. Now that we’ve dealt with getting the correct equipment to produce a professional blog video, we will look at how to set up lighting and audio to create the best quality, professional looking and sounding video. 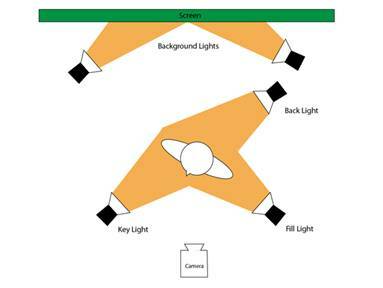 You will need five lights to create the perfect lighting scenario. But you can get away with less. In fact you can get away with one light, a window and a reflector board. Three-point lighting is a common technique used by both videographers and photographers. It is used to give life and texture to the face, to define the body and to light the backdrop evenly. The first and most important light is the key light. This light is placed at a 45 degree angle and is higher than the camera. This lights the side of the subject’s face. If the light is focused directly on the face of the speaker, you will lose all definition, sense of texture and dimensionality, blanking out the face. The key light highlights the person’s features. If you only have one light, use it as a key light. You can place the subject by a window with the key light on the other side. The window light will act as the fill light. The light must be bright but not so much so that it creates a harsh, white light, which potentially blanks out the features on that side of the face. The light’s strength can be reduced or increased by changing its distance from the subject. This light is less bright than the key light. It is placed on the opposite side of the key light, at an angle of around 25 – 30 degrees at the same height as the camera. This light fills in the shadows on the other side of the face. You can lower the intensity of the fill light by using a diffusion material (this is a supple plastic, slightly opaque, sheet that pegs in front of the light) or by moving the light back. This is placed behind the subject (but obviously not direct behind him or her so it is in the shot). This light just defines the back of the person creating contrast between the background and the subject. These are two lights that evenly light your chroma key background. The subject must be far enough away from this lit-up wall so as to avoid the colour of the wall “leaking” on to the subject. Your mic needs to be close enough to the subject so that it only picks up the voice and not the ambient sounds of the room. You need to test and watch the level of the sound on your camera. The sound level needs to be balanced. If it is set too high it will spike and “clip” causing distortion. If too soft the signal to noise ratio will not be optimal. The signal has to be as high as possible without clipping. A good level is around 70%. This gives you enough room for louder words but is not too low so as to pick up too much other noise. Video blogging needs to be done often to be properly effective, so it can’t be a huge hassle to set up. If you can spare a corner to leave your lights up permanently then that would be best. If not, mark the position of the lights with masking tape so you don’t waste time adjusting them every time you want to do a blog. The same goes for your sound. Spend time finding the perfect level for your environment and note it down, then, barring any changes in noise levels, you can always just adjust it to that level. When shooting your blog you will invariably make a mistake with the script. You’ll then need to scroll back a little on your auto-cue and redo that line. But you will also need to change the shoot composition. This is so that you have something to cut to when you cut out the blooper line. If you don’t change from say a medium shot to a close-up then you’ll have a jump cut. This is when a person’s head jumps from one position to the next in the same shot. It looks shabby and can be easily solved by changing angles or the shot composition. In the third and final part of this blog series we will look at how to use the editing and postproduction process to best package your video. Have you set up lighting and audio before? Can you add to these suggestions?